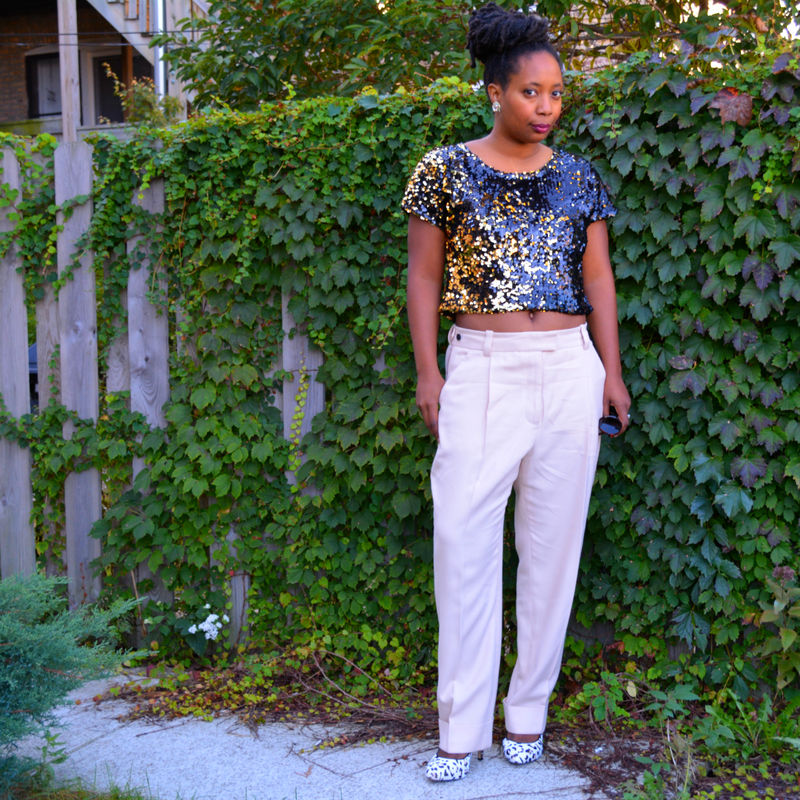 I wore a crop top at almost 40 and white pants after Labor Day and lived to tell the tale. 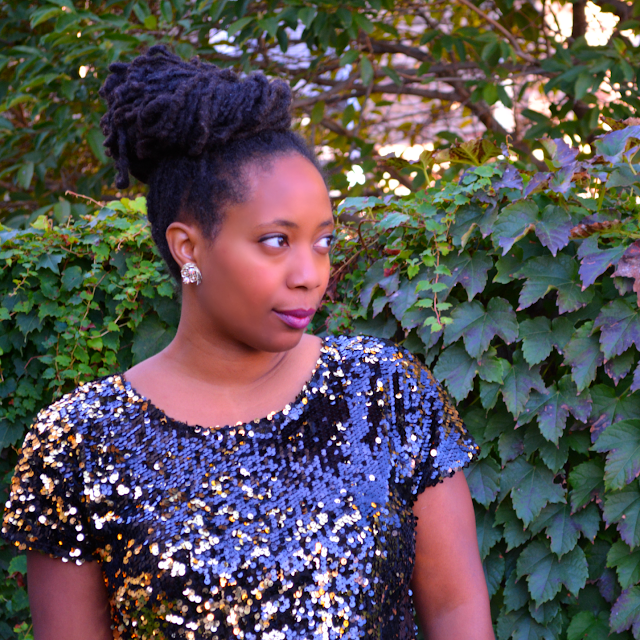 Continuing my theme of bucking trends and fashion rules, I played around with some of my favorites - sequins, menswear, and animal print all at the same time. It wasn't until I visited my mom in Vegas that I discovered how alike our fashion tastes are. I spotted a gorgeous sequin vest in her closet. She said she got it from the Liberace Museum liquidation sale and told me to take my mitts off of it I could not have it. It's like we're living a parallel life searching out sequins and sales. She's a thrifter and department store sale queen. As a consolation prize, she bought me a sequin top for my birthday. Remember the most unflattering pants ever? Well, I may have a new winner. I lurve seriously lurve the 3.1 Phillip Lim tuxedo pants I thrifted last year. I don't understand them though. I don't know if they're too big or if they're supposed to be this slouchy? The mannequin looks great in them! She doesn't have stumpy legs so..I put them on eBay a few months ago. No takers. They retail for $375 so I pulled them out for a second look. Nope still not working. Back to eBay they shall go. 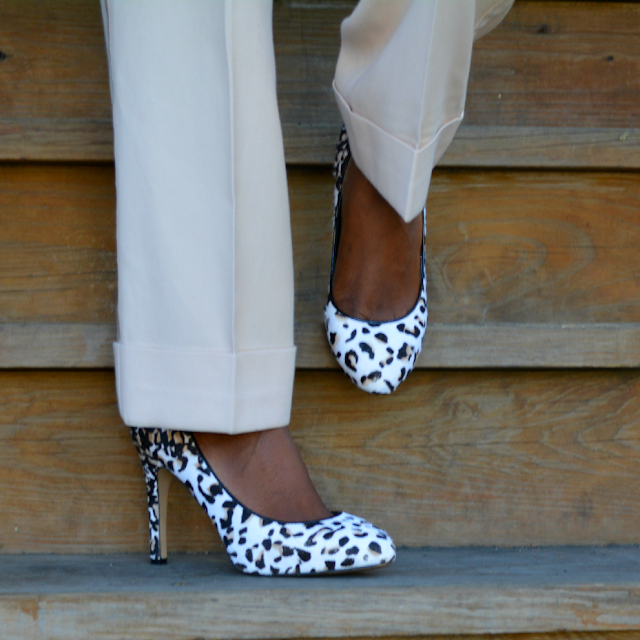 The pumps are a recent find and I had one of those fall out in the aisle moments when I saw them because I do not own a pair of animal print high heels. Shocking. The panther pumps are in great condition too. No bald patches on the calf skin or jacked up heel caps. As my left foot is a half size bigger than my right, left big toe is not so thrilled about this purchase. To ignore big toe or sell? What rules are you bucking? What trends are you creating? I love sequins. My kids make fun if this need of mine to be all sparkly. Sequins also don't go over well in the library but I'll be darned if I won't roll up in here like a Solid Gold Dancer. :-) Love your top by the way. great look! 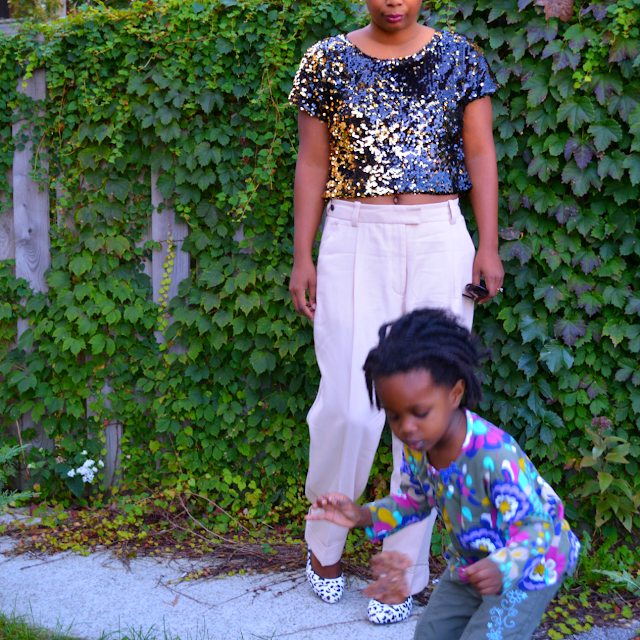 i bought a sequins crop top and i rocked it at 44! lol! i really like those pants! philip lim, huh? nice! Love this! 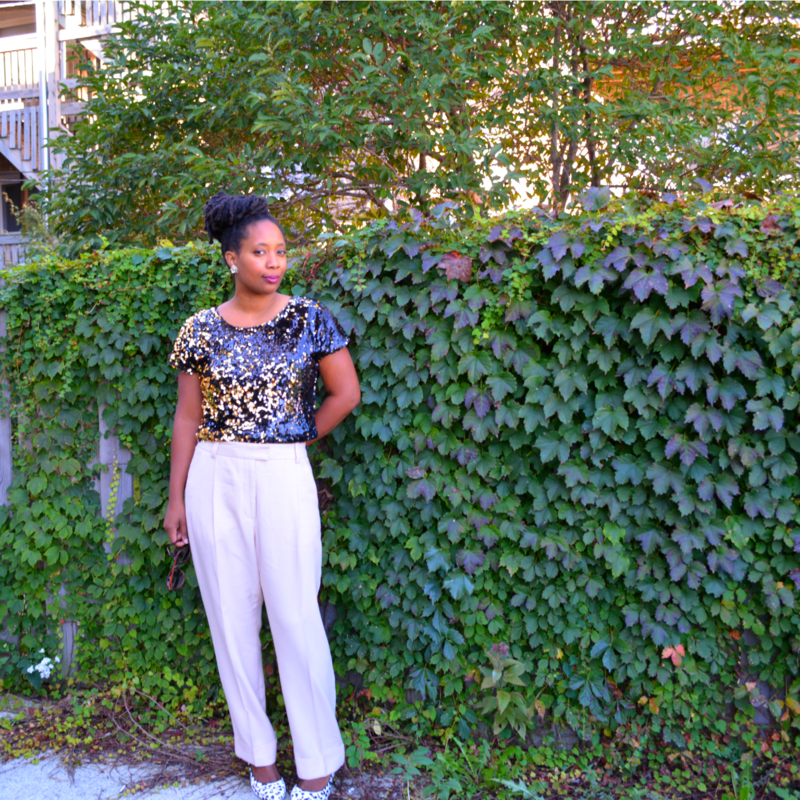 A good trouser pant is always a chic choice in every season! I absolutely LOVE this!! Such a chic look girl! That top is everything! You look fabulous! I have a broken bone in my left foot that gets quite angry with narrow shoes! I think you should keep the pants. The models online wore them baggy. You look so on-trend it's crazy! And now I kinda want to see pictures of your Mom. This top is so YOU!!! i love the rebel in you! ... and that top too! Yes!!!!! How could anyone not like sequins? I really like your sequined top! 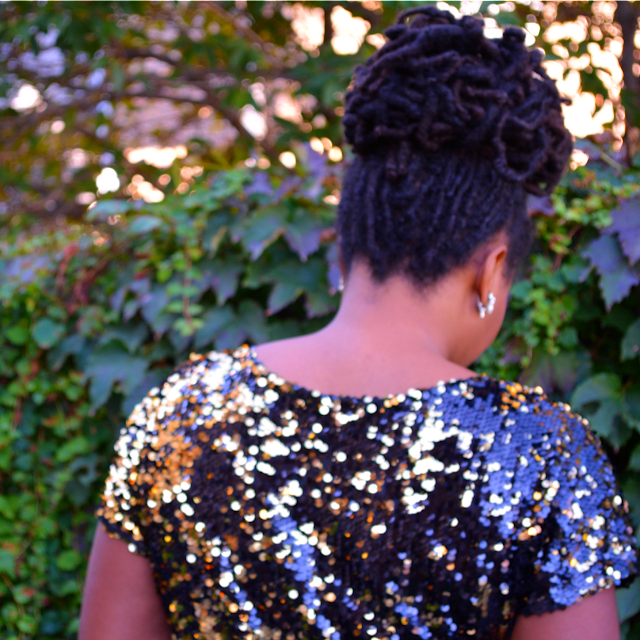 It's always fun to sparkle a little bit!